It seems between the top photo and the bottom selection that Sonja changed clothes, lol. It looks like a rather innocent stumble, without any greater meaning. oops, that could have been gone wrong! Great reactions, Haakon! 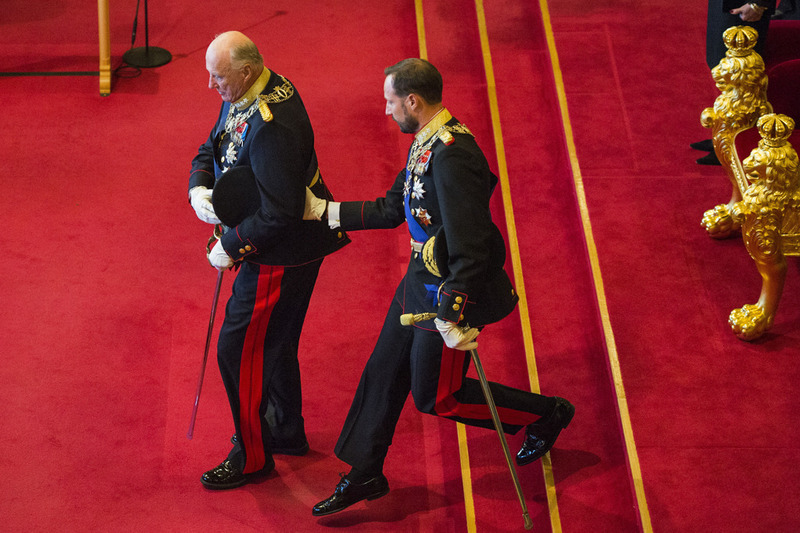 The King seems to have had a bit of an unusual gait to his walk for a while now and from the video it simply looks like his foot didn't really go where it needed and on the narrow steps he nearly fell. Good reactions from Haakon! To me, that looks very worrying, not at all a simple stumble. He didn't seem to know where the steps were at all. Why on earth have the King give the speech standing up? The throne's there, for goodness sake, let him sit in it! Very strange. Last year (?) he skipped an entire page of the speech while reading it, which is far more worrisome in my opinion than a stumble on the stairs. Both King Harald in Norway and Queen Margrethe in Denmark look increasingly frail, which raises again the question whether abdication should become a normal trend now that, due to advances in medicine, people live longer , sometimes up to a very old age. That was 2 pages getting stuck together, hardly the same thing in the slightest. 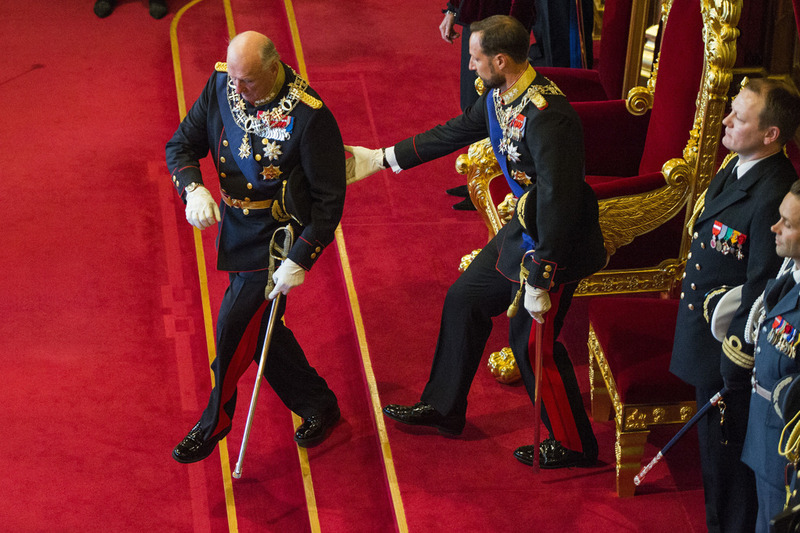 This is off topic, but abdication weakens the entire idea of monarchy in the 21st Century. It may have some short-term benefits (lots of people here get to ooh and aah over younger women wearing new-to-them tiaras), but in the long term it compromises the fundamentals of the institution. Until Harald's mental faculties leave him, he should carry on, while giving his son more to do (no bad thing as Haakon strikes me as one of the most anonymous heirs in Europe). I total agree with you abdication does weaken the entire idea of monarchy. unless people are ill. So the monarchies in the Netherlands, Luxembourg, Belgium and Spain have weakened because of abdications? For me it are not abdications which weaken the entire idea of monarchy. It are exactly all these marriages to all those commoners which are eroding the whole concept from within. What do we mean with "royal" family when an unmarried mother with a child from someone else can become Norway's Queen? Or just marry that newsreader all Spaniards saw on their TV-screens? Or the daughter of a discutable figure whom served in the Argentine Junta? That everyone, the girl around the corner included, can become "royal" is exactly more undermining the whole idea of having a royal family, with a royal birthright, living in royal palaces and leading a royal lifestyle, royally funded by taxpayers than a monarch abdicating after a long and dedicated service, usually at an age far past the general retirement age. Hello. It looks as if the rostrum in the main chamber of parliament is removed and replaced with thrones for the opening of parliament. Is this correct? On the occasion of the formal State Opening, the Storting Chamber is rearranged and the throne positioned where the President of the Storting and the rostrum of the Storting normally stand. A table for the President of the Storting and the Secretary to the Presidium are placed down in the chamber, in the semicircle in front of the seats of the Storting members. The tradition of bringing out the throne and the chairs of the Queen and the Crown Prince on the occasion of the formal opening is so old that we have no firm sources as to its origin. The King, accompanied by the Queen and the Crown Prince, will open the 162th Storting on October 9th. The opening will be broadcasted by NRK1 and TV2 News Channel as usual. The last time King Haakon opened the Storting before he fell in his bathroom at Bygdøy kongsgård in July 1955. He never recovered and died aged 85 two years later on September 21, 1957. His death saw an outpouring of grief. King Olav became king of Norway at King Haakon's death on September 21th, 1957, but because the Storting did not meet in the autumn of 1957, the oath was first taken in the Council of State and then repeated solemnly at the opening of the Storting on 20th January 1958. The Storting Chamber was then undergoing reconstruction, so the ceremony was held in the Lagting Chamber. The last time King Olav opened the Storting before he was rushed to hospital with heart problems in May 1990. The King's condition deteriorated at the Rikshospitalet (hospital in Oslo) and he suffered a stroke. He died on January 17th, 1991 at the age of 87. His death saw an outpouring of grief. I've worked with this post 10 min each day since Wednesday. I will make a second post with some historical facts tomorrow. 1. Queen Maud attended 5 openings, the last time in 1922. 2. Queen Sonja has participated during all openings, except 1992, 2000 and 2001. 3. Some of the MP's didn't want the Queen to attend in 1991, but the King insisted. King Olav started the tradition of using an open car for the ceremony after he got a new one in 1966. A5: This is a Lincoln Continental purchased in April 1966. This is the car used during the wedding between Crown Prince Harald and Crown Princess Sonja in 1968 - and later at the wedding between Crown Prince Haakon and Crown Princess Mette Marit in 2001. It was rented for the wedding in 2001 because it had been sold (to disappointment from many) in the meantime. Why? The court bought a new ugly limousine where the roof could be lifted down. The Lincoln Continental was purchased back by the Royal Court in 2002. The car is still used on official occasions and has been used for most Stortings openings by the King and Queen. It's one of two open cars. The other is the Iconic A1, a roadmaster from 1939. See them arriving in all the NRK broadcasts in the above post - at 4:50 in the 2015 video and at 4:30 in the 2016 video. We are a laid back country and its not usual with large crowds here, but there are usually many people in Karl Johans gate (the main street from the palace to the Storting) to watch it. A bit difficult to see in the two YouTube videos, because we don't see pictures from Karl Johan when they arrives, but you can watch it in the NRK videos in the above post. Thanks for some great and informative posts RN. You must've been busy for days. Actually, I didn't spend that much time on it. Post 117: I worked 10 min each day from Wednesday to Saturday, so I used about 30-40 min on it. Post 118: About 20 min. In other news: Both NRK1 and TV2 News Channel will send it live tomorrow as usual. TV2 The news channel sends live from the opening Monday. The ceremony starts at 13:00, but we are live from the Storting already at 12:00. As a guest in the studio we have Carl I. Hagen (former leader of the Progress Party). And we have our own team in the Storting and at the top at Løvebakken (the place outside the storting)!